Over the past 60 years since initially coming to Penn at the age of 16 as a student, Sam Maitin has made his mark across the University and around the globe. Described as “an unrelenting humanist” with “a zest for life” he was a social activist as well as an international artist well known for his joyful, abstract, 3-dimensional constructs. 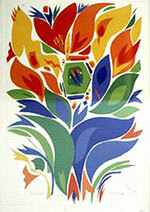 His silkscreen prints, paintings, and sculptures are in museums in the United States and Europe, with several at Penn. His work appeared on the covers of the Pennsylvania Gazette many times over the decades, including a self portrait (December 1987), genetic technology (June 1997) and his most recent, focussing on the faculty for a Centennial issue (March/April 2002). He has contributed banners and prints to several schools at Penn to commemorate special events such as the tenth anniversary of SAS. See www.upenn.edu/gazette/0501/biberman.html. His numerous exhibitions on campus culminate this year with the long-planned Sam Maitin: A Life in Art opening February 10 and running through April 17 at the Arthur Ross Gallery. Works will be shown concurrently at Penn Hillel. There will also be an exhibition at the Burrison Gallery at the Faculty Club. The serigraphs John Ciardi Print, “whatever magic you expect from dreams is heavy on the air,” (above left) and Good Health (above right) were shown at there in 1996 in the exhibition Recent Work and other Flights of Fancy. 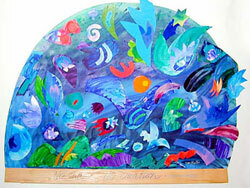 Festival, 2004 (left), enamels and collage, created for the Arthur Ross Gallery. 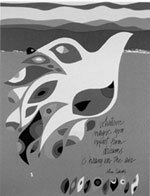 The work will be shown in Sam Maitin: A Life in Art at the Gallery, February 10 through April 17. This work was used as the Gallery’s holiday card this season. 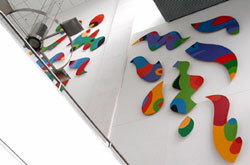 Below, Celebration, a 15 x 15 foot polychrome dimensional mural designed and constructed by Sam Maitin, commissioned by Walter and Leonore Annenberg for the Annenberg School for Communication in 1975. The mural, which fills the east wall of the school’s lobby, was on this year’s holiday card from the dean and the school in honor of their gratitude to the artist and the Annenbergs for “their generous and enduring gift. The mural has indeed become an ongoing ‘celebration’ of their friendship, vision, and spirit for the entire Annenberg community—past, present, and future.” See www.asc.upenn.edu/asc/news/articles/122304maitin.html. When the Christian Association relocated to its current site, it took with it the mural that Sam Maitin had created for it 15 years before and commissioned him to do a new one as well. Below, “Night” with the Mason Cooley quotation, “No chaos, no creation,” is one of the two newer murals designed for and installed in the CA’s Upper Room; see http://www.upennca.org/ for a virtual tour of the space. A series of four posters by Sam Maitin showing eight different studies for the murals is available from the CA.